Once again, the celestial sphere is in critical mass resulting in another list of mind-bending predictions. This weeks conglomeration includes: garlic, a Viking, and the ever popular Umpa-Lumpas. Aries… Mars is in semi-diurnal position now. That is not a good sign for an Aries. In the future, you are going to use one of those germ killers that kill 99 %of the germs, but you won’t rest until you find the last 1 percent. You won’t sleep for weeks looking for them. Taurus… Venus is suffering from excess gas at the moment. That’s never a good sign for a Taurus. In the future, you will lose many friends after you win a garlic-eating contest at a county fair. Gemini… Mercury is on the cusp of Gemini and in juxtaposition to Mars. That will bring you problems. In the future, you will be arrested for jostling Jocelyn, Joyce and Josephine. You will spend some time in jail alongside Dennis Miller. Cancer… The Moon is in hyper perplectic mode now. That’s a troubling sign for you. Sometime in the future, you will convince yourself that there really is an Umpa-Lumpa Land. You will spend the rest of your life searching for it. 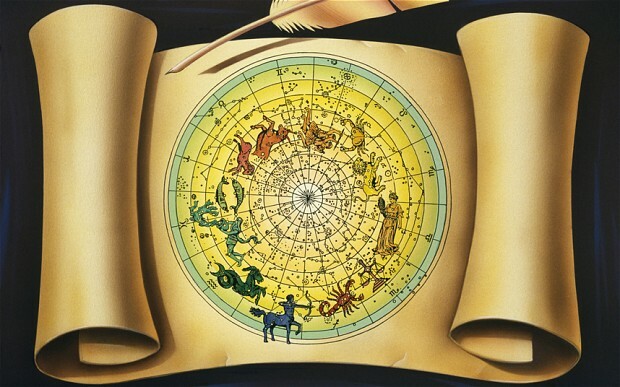 Leo… The Sun is in lower-helial position now and in opposition to Leo. That portends problems for you. In the somewhat distant future, an electrician will give you some shocking news. It will get you all wired up to the point where you will blow a fuse. Let’s hope you can handle that. Virgo… Saturn is in quadra-dialectic mode now. It’s never a good sign for a Virgo. One day, a wolf in sheep’s clothing will pull the wool over your eyes in textile factory. You will break out after an allergic reaction. Libra… Jupiter is in its eighth house having some window treatments installed. Things aren’t going well. That means trouble for you. One day in the future, a Viking on a viaduct will vanquish you. It will not be a pleasant experience. Scorpio… Uranus is it in the urinal business now and not doing well. That spells trouble for you. In the future, you will be obsessed with the phrase, “mumbo-jumbo”. You will try to fit it in every conversation as often as possible. People will think you are weird. They will avoid you. Sagittarius… Pluto is in tri-quadrinal position now and square with Sagittarius. That is not a good combination. In the future you will showcase your collection of rectal thermometers only to discover you should have cleaned them before you put them on display. Capricorn… Mars is in oppositional mode now. That’s always bad for a Capricorn or a day-tripper. One day in the future your tongue will suddenly cleave to the roof of your mouth. That will cause you much distress especially in the area of communications with others. Good luck with that. Pisces… The Earth is in counter-opposition and square with Pisces now. Those two things are never good for a Pisces. In the future you will spend much time and money developing the perfect peanut butter to feed jellyfish. It will be a huge waste of time, ending in depression for you. Aquarius… Neptune is in its fourth house and has just discovered that all the fish in its aquarium have died. That’s not a good sign for an Aquarius. In the future, a judge will issue you a gag order. Afterwards, you will constantly shove your finger down your throat in order to comply. It will not be pleasant. People will avoid you. Thanks. I’m happy to hear that. Gee, thanks … it’s still morning and you have me ready for the gin.